PT Designs website design | FSC Nationwide deliver fire extinguisher & alarm servicing and maintenmance in manchester and nationwide. 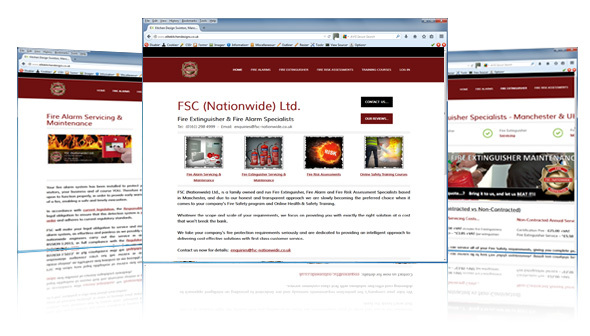 FSC Nationwide is a family owned and run Fire Extinguisher, Fire Alarm and Fire Risk Assessment Specialists based in Manchester, and due to our honest and transparent approach we are slowly becoming the preferred choice when it comes to your company's Fire Safety program and Online Health & Safety Training. FSC (Nationwide) Ltd can service all of your Fire Safety requirements, from Fire Extinguisher Maintenance, Fire Alarm Servicing and Fire Risk Assessment, giving you complete peace of mind and assisting your business to remain compliant with UK Fire Safety Regulations. Whatever the scope and scale of your requirements, FSC Nationwide focus on providing you with exactly the right solution at a cost that won't break the bank. FSC Nationwide take your company's fire protection requirements seriously and are dedicated to providing an intelligent approach to delivering cost-effective solutions with first class customer service.